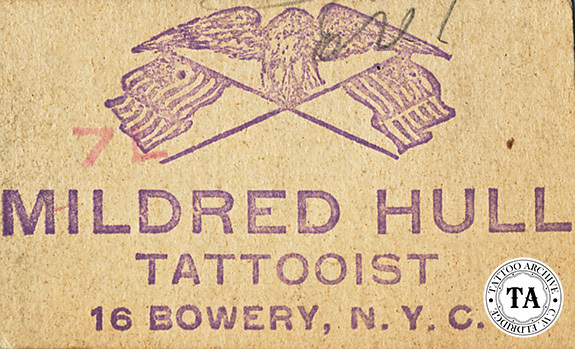 From the 1840s up to the 1960s (when tattooing was banned in New York City), the Bowery and the City itself was a Mecca for tattooing. The list of tattooists that worked there reads like a Who’s Who of the tattoo world. Many tattooists during those years were just passing through the City, but a few stayed and made it their home. During this time the tattooists were almost all men. Mildred Hull was the one major exception. Affectionately known as Millie, she was one of the few women to work on the Bowery in New York City. Her #16 Bowery shop was located in a barbershop. Several New York City tattooists worked like this, including Charlie Wagner. 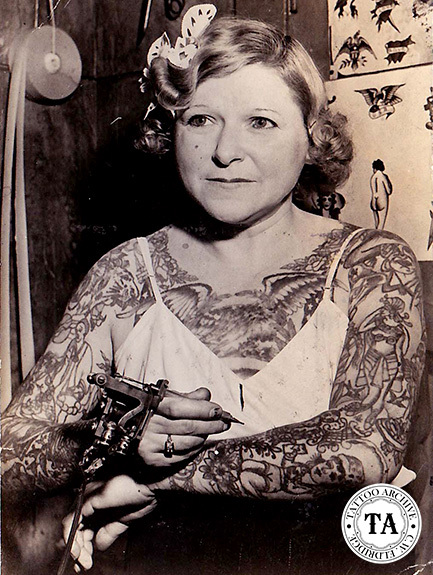 Old time tattooists were famous for setting up in closet-sized locations in arcades, under stairways, and even in horse-drawn wagons. A barbershop with a clean space, a male customer base, and a corner for rent was reason enough. The 1930's postcard seen here shows Millie with her favorite square back Jonesy. 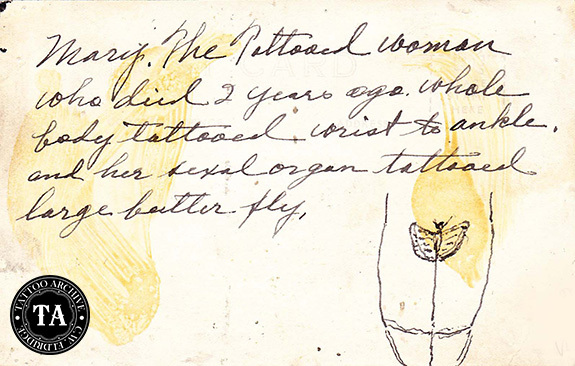 On the back of the postcard, she is referred to as Mary and states that she is a member of the famous "Butterfly Club" complete with an illustration of the required membership tattoo. Millie committed suicide by poison in a Bowery restaurant in 1947. The text above is an excerpt from The Life & Times: Milldred Hull booklet. Look for it in our online store.